PDC Spas Celebrating 60 Years! Long before hot tubs and spas became a fashionable and desired part of many homes, PDC Spas was on the cutting edge of that emerging business. For 60 years this business has been meeting the needs of homeowners and consumers in various forms and ways. Business began as a “job shop” in 1957 by David Livingston, Plastic Development Company. Located on Beauty’s Run Road in Cogan Station, sidewalls for in-ground swimming pools and jeep bodies were the primary items built at that facility, utilizing fiberglass and resins in the production. In 1982, David Livingston II took over the company and retooled it for what appeared to be growing interest in the hot tub industry. Three designs were introduced, manufactured with gelcoat finish and fiberglass support backing, similar to the production process for pool sidewalls. Under new leadership, PDC recognized significant changes in facility, employees and product line-up, servicing major metropolitan regions around Williamsport. A year later in 1983, the facility burned to the ground as a complete loss. David and his wife, Lynda, identified a new location on West Fourth Street in Williamsport, and chose to start again despite the catastrophe, as the potential growth in the hot water industry showed promising future. The new location demanded major renovations and a redesign to accommodate the fiberglass manufacturing known to PDC. 60 years later, PDC manufactures at the same location. Robotics now assist in the manufacturing process, custom built thermoforming equipment is in place producing swim spas up to 19 feet. PDC Spas serves the local retail market, wholesales and distributes worldwide to specialty retailers, and meets the growing internet marketplace. PDC Spas continues to lead the growing swim spa industry with their patent pending propulsion technology. Designed for athletes in training, fitness enthusiasts or those simply looking for a better lifestyle, swim spas are the solution. As the baby boomer population ages and all consumers are more aware of wellness, the non-weight bearing water workouts are the answer for those with arthritis or joint pain. Aquatic workouts are proven to burn more calories faster than traditional land based exercises. 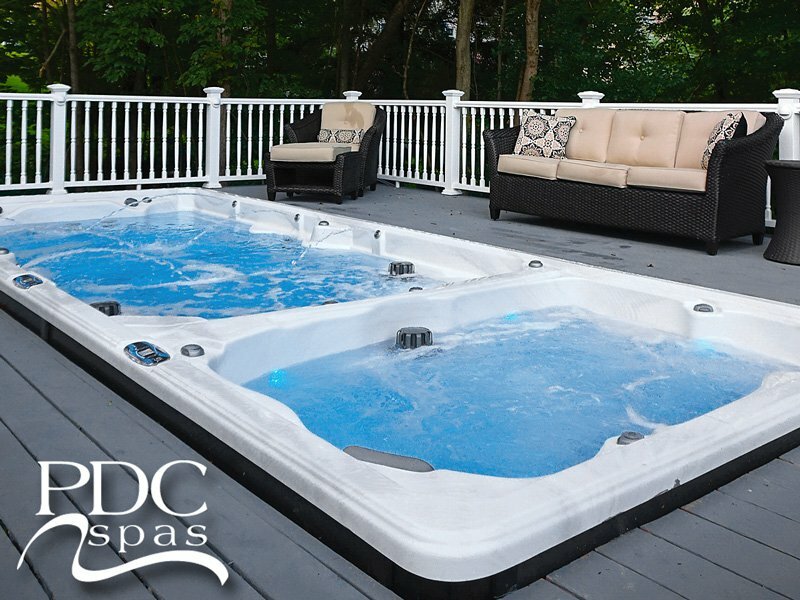 The PDC Spas swim spa collection offers models from a space saving 12 feet to a very popular dual zone 19 foot model that includes a 5-seat hot tub zone and a separate fitness zone. For families, a swim spa offers year round backyard enjoyment, a perfect place for teaching ones to swim, and quiet relaxation time we all seem to have so little of. The hot tub line-up at PDC Spas includes three Series with features meeting every consumer demand. A total of 16 unique body-hugging models in a wide spectrum of colors and finishes offer massaging hydrotherapy soothing mind and body alike. This well-known manufacturer backs their products with a 35 year warranty assuring the buyer they receive the product quality and craftsmanship that only 60 years of expertise can back. The innovation continues for PDC with the 2018 introduction of a patent pending product serving the industry.